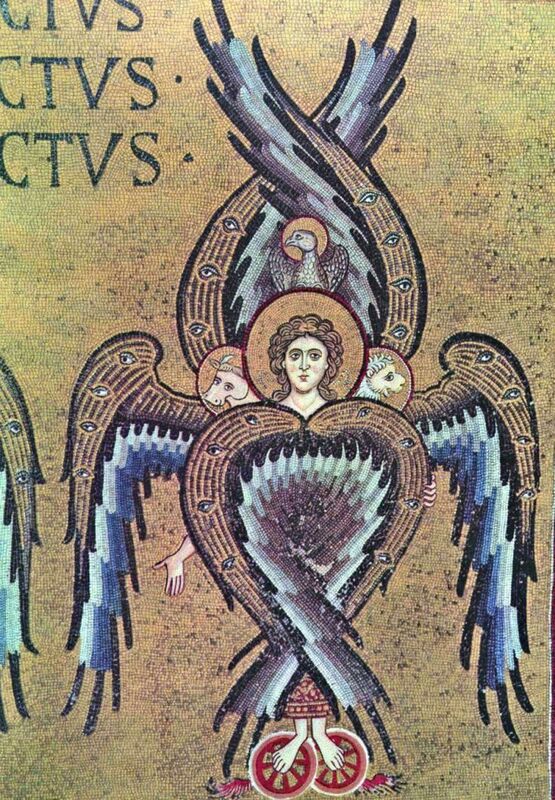 In the picture you see a seraphim (a six winged angel), that is also a tetramorph(an arrangement of symbols).The simples in this tetramorph are the four evangelists, Matthew (the man ), Mark (the lion), Luke (the ox) and John (the eagle). there is a lot of line work in the piece as it helps outline the wings, to distinguish it from the back ground. The wings also have two other colours, a dark and light blue, and have eyes spaced out on them. Saint Mathew is standing on two red circle – like things that have wings protruding from them giving the illusion that the tetramorph is flying. There is also a peak of the red embroidered garment that saint Matthew is wearing. This mosaic is found in the Basilica Cathedral of Santa Maria Nuova of Monreale, in Monreale, Sicily, Italy.it is from the 12th century.